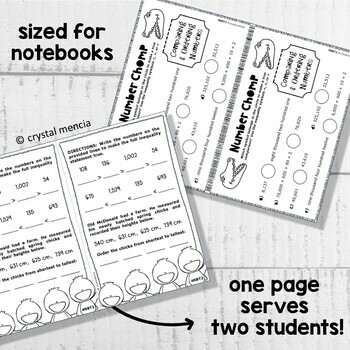 These 4NBT2 Read, Write, & Comparing MultiDigit Numbers activities are LOW PREP and great for interactive notebooks! Each blackline master included in this resource reduces paper consumption by providing materials for at least two (2) students and are sized perfectly for composition notebook use. 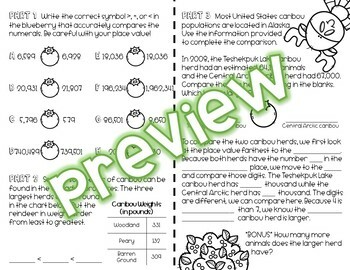 4.NBT.A.2 - Read and write multi-digit whole numbers using base-ten numerals, number names, and expanded form. 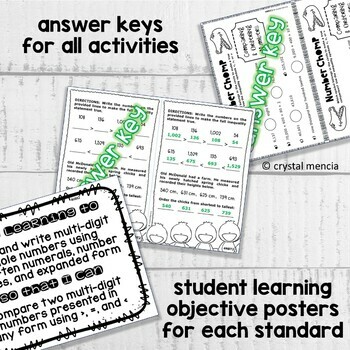 Compare two multi-digit numbers based on meanings of the digits in each place, using >, =, and < symbols to record the results of comparisons. PRINTING DIRECTIONS: Resource should be printed single-sided using the “print to fit page” option and cut on the gray/blue line (usually center of page) for multi-student use. 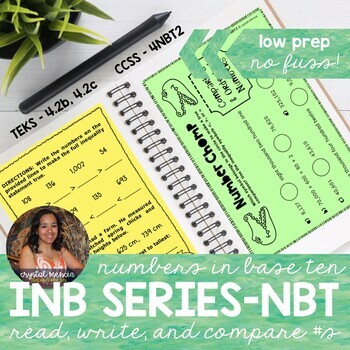 By purchasing now, you are guaranteed to all current and future 4NBT2 Read, Write, & Comparing MultiDigit Numbers INB Series created by Crystal Mencia (First In Fifth) at no additional cost!